With the recent surge in popularity of lever action rifles in general, and Marlin's big bore hunting lever actions in particular, many hunters and shooters have been searching for a better way to put a scope sight on their guns. 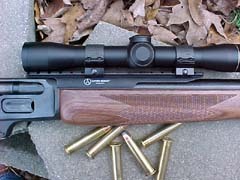 Marlins have always been relatively easy guns upon which to mount a scope, but the conventional method of placing the scope directly atop the action has affected both the versatility and handling qualities of the rifles. Some shooters prefer a scope mounted in this fashion, and others do not. When speaking big bore lever guns, I place myself in the last category. 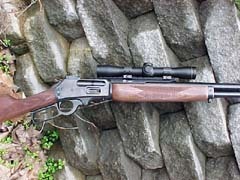 A large, bulky scope on a lever action rifle, while making it much easier to place a shot at moderate to long distance, does nothing for the handling qualities or the aesthetics of the rifle. At the same time, mounting a scope over the action precludes the use of a receiver-mounted aperture sight as a backup, should the scope become unserviceable during the course of a hunt. Recently, AO Sight Systems has come up with a solution, the AO Lever Scout scope mount. This mount allows the mounting of an intermediate eye relief "scout" scope just ahead of the receiver on Marlin's excellent Guide Gun and Outfitter rifles. 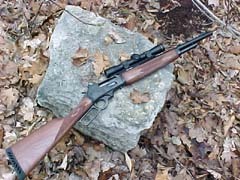 They also are developing this mount for other popular lever action rifles such as the Winchester Big Bore. Mounting the scope in this position allows the shooter a very quick sight picture when the gun is brought to the shoulder. This AO Lever Scout mount, when coupled with a quality low-powered scope, enables a shooter to mount and fire the rifle with both eyes open, greatly enhancing the field of view. Another real advantage of placing the scope ahead of the receiver, is that it allows the use of AO's Ghost Ring sights [Ed. Note: see Jeff's article on the AO Ghost Ring sights at AO Ghost Ring - Boge Quinn] as a backup to the scope. In the case of a damaged scope sight, the hunter could loosen with a coin or screwdriver the scope rings, and in less than a minute be back in the hunt with the Ghost Ring peep sights. Also, under some weather conditions, a scope is just not usable, such as the case of heavy rain or snow. Again, with the Lever Scout mount, the scope can be quickly removed, and later replaced with no significant loss of zero. I recently received for testing the AO Lever Scout mount along with the excellent Leupold M8 2-1/2 power Scout scope. Anyone even remotely familiar with shooting and hunting optics knows the name Leupold means quality. Leupold makes some of the most respected optics in the world. Their riflescopes are the first choice of many of the world's most elite military and law enforcement units. Members of these units know that when it comes to optics, second best is not good enough. Hunters and target shooters have also depended upon Leupold scopes for many years. They are the scopes to which all others are compared, and have very few peers when a high quality scope is needed. The combination of the AO Lever Scout and Leupold Scout scope jointly received the award for best new product at the 2001 SHOT show in New Orleans. When mounted on a new Marlin Guide Gun, it was also one of the most looked-at and handled products at the show. I attached the scope mount to a new Marlin Guide Gun in 45-70 caliber. 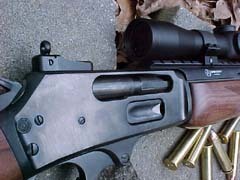 The mount went on easily after removing the rear sight from the Marlin with the drift punch provided with the AO mount. Everything needed, including clear and detailed instructions, is provided with the mount. I used a set of Weaver low rings, which provided plenty of clearance, to attach the Leupold M8 to the mount. The result of this project turned out even better than anticipated. The Leupold Scout Scope is very compact, measuring only ten inches in length and adding very little to the weight of the Marlin, while neither adversely effecting the handling or the looks of this fine lever gun. The precise, clear optics of the Leupold combined with the sturdy, high quality AO mount proved handy to carry and easy to get on target. This is a combination that I plan to leave mounted on the Guide Gun. I can think of nothing better to carry on a hunt for the largest game that walks this continent when the shooting will be at close to moderate range. And if the weather turns foul, the AO Ghost Ring sight is there for backup. For more information on the AO mount, contact the manufacturer at: www.ashleyoutdoors.com. 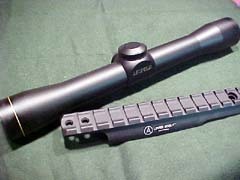 To see the specifications on the Scout scope and all Leupold products, click on www.leupold.com. You won't be disappointed. AO Sight Systems Lever Scout scope mount & Leupold M8 Scout Scope - the combo that won "Best New Product" at the 2001 SHOT show. 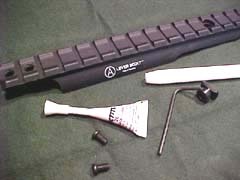 The AO Kit - mount, nylon punch, dovetail stud, locktite, screws, and Allen wrench. The AO Sight Systems Lever Scout and Leupold M8 Scout Scope mounted on a .45-70 Marlin Guide Gun make a hard-hitting, easy-handling, and good-looking hunting rig. AO Sight Systems Ghost Ring iron sights are still available in case the scope becomes inoperative.